I hope you're having a wonderful week. I was sick over the past few days which prevented me from making blog posts that I've wanted to make, but I am proud to announce that I am finally feeling better! This means I can talk about something that I gave up doing for at least 7 years... crafting! I loved crafting when I first joined the game and crafted up until Zafaria was added to the game in 2011. After Zafaria, I gave up my original crafting adventures because I wanted my main focus to be on the storyline, that is until the creation of my new myth wizard, Edward Gem. Mr. Gem and the amazing people that quest with Autumn & I every Tuesday inspired me to start crafting again. We only quest once a week, so we have plenty of time to do side quests (such as crafting) on our wizards when we're not questing. So let's talk about the first crafting quest from Wizard City. You can collect the first crafting quest from Eudora Tangletree in Olde Town. The first part of the quest requires you to find Mist Wood (which can be found in Olde Town). 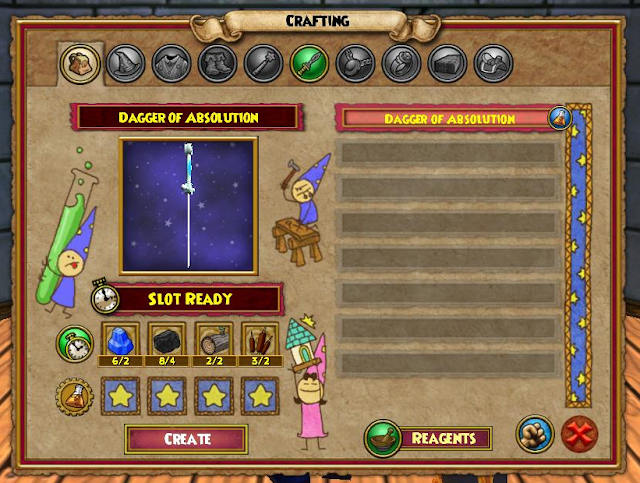 After you turn the first quest in, you'll get another quest that requires you to craft 2 Daggers of Absolution. You can look for reagents or buy them from vendors. Below you'll see what I did to create the two daggers. Crafting in Wizard City was very easy to do! I found everything I needed in a short amount of time. 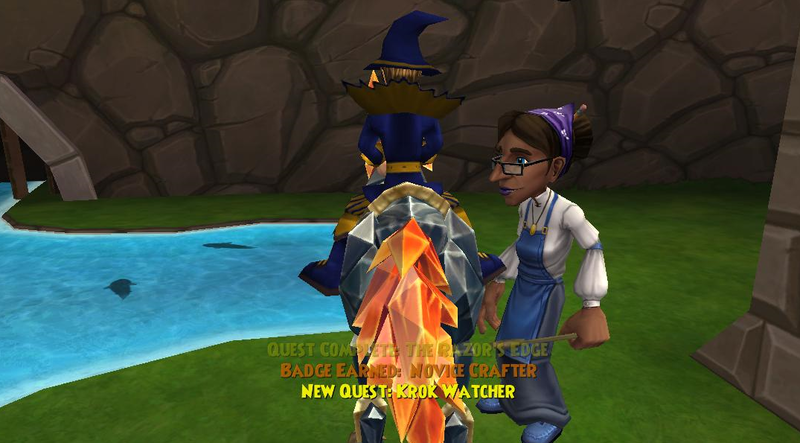 I think the only advice I have to offer you if you do plan on crafting is to collect any reagents you see (especially during the member benefit time). This Novice Crafter will prepare in advance for my next crafting quest in Krokotopia. I plan on collecting as many reagents as I can as I continue questing and side questing. Let's hope the next quest is this easy. Thank you all for reading! Until next time, I'll see you around the spiral.